The University of Southampton's Professor Neil Wrigley has been presented with the Outstanding Impact in Business award by the Economic and Social Research Council (ESRC) for his research which has transformed thinking on food retail development and the future of UK high streets. Professor Wrigley, an expert in economic geography, received the accolade at the ESRC Celebrating Impact Prize awards ceremony, held at the Royal Society in London last night (Thursday 5 June). The Outstanding Impact in Business award recognises research that has generated business impact through successful knowledge exchange and engagement. 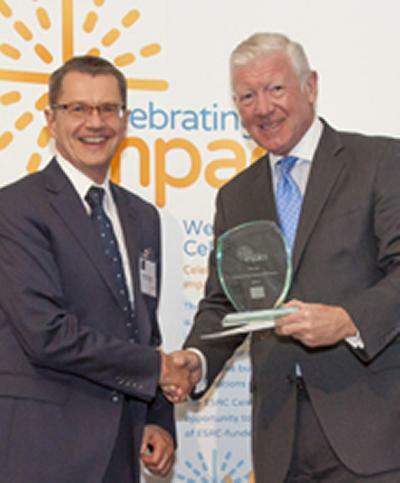 A £10,000 grant for further engagement and impact activities was presented with the prize. Professor Neil Wrigley leads a University of Southampton research team whose sustained and innovative contributions have changed the debate on retail sector practices, contributed to government policy, and helped convince key industry players of the value of large-scale, high quality academic research. A three-year 'before/after' study into the impact of new ‘in-centre’ and ‘edge-of-centre’ supermarket developments found that, contrary to widely expressed fears, these developments do not necessarily lead to less trade in town centres but often play a critical role in sustaining the economic health and vitality of those centres. Neil’s research is now relied upon not only by retailers but by the urban planning community and other stakeholders. More recently, Neil’s work on the impact of the global economic crisis on UK town centres, and his work as the sole academic member of the Government's Future High Streets Forum, has helped shape thinking on the future of Britain's urban centres. “We have tried to understand which town centres coped better than others during the recent economic crisis, what that implies about the future resilience of our towns, and what type of high street will have the best future,” he explains. Research the professor carried out over a decade ago into the problems of food access in deprived urban communities (so-called ‘food deserts’) continues to influence national and international policy on retail-led urban regeneration. Through presentations to the British Retail Consortium, the All-Party Parliamentary Food and Health Group, the World Economic Forum, and the US National Academies, Neil’s research has also influenced attempts to understand and reduce the impacts of local food environments in encouraging obesity.